Congrats, you just activated your 24 hour free trial! Enjoy your full access to all video lectures, quiz questions, articles and the board-style Qbank for the next 24 hours FOR FREE. 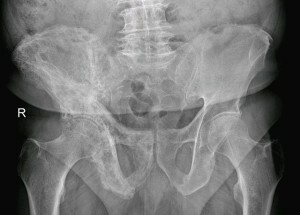 This course covers everything you need to know about Paget's Disease of Bone. Raise your test scores with the support of high quality videos today! You're currently in preview mode. Create your free account to save your progress and access more questions. For the purposes of the USMLE, it is important to be able to identify and understand the pathophysiology of the Paget's disease and how to differentiate it from other musculoskeletal disorders. Throughout this article you will find the details of Paget’s disease and the key points bolded. You probably know MD Edward Goljan and his Rapid Review Pathology Series. But do you know the "new" Goljan? His name is Carlo Raj and he is currently following his mentor's footsteps by presenting you pathology as you have never experienced before. Carlo Raj has earned his MD at the Medical University of the Americas (MUA) and continued his medical career as professor of Pathophysiology at the Becker Professional Education, Chicago, USA, and as an international lecturer and author—both assisting MD Edward Goljan and later on his own. Today he teaches at Becker Professional Education and is also CEO of Indus Intellect, whose goal it is to spread medical knowledge across the globe. 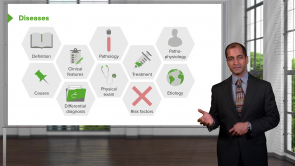 Bookmarks will help you organize our more than 2000 medical videos, and customize your learning experience for more efficiency and better results. © 2019 Lecturio GmbH. All rights reserved. USMLE™ is a joint program of the Federation of State Medical Boards (FSMB®) and National Board of Medical Examiners (NBME®). MCAT is a registered trademark of the Association of American Medical Colleges (AAMC). None of the trademark holders are endorsed by nor affiliated with Lecturio. You have one in your basket.